"Since the raw materials are critical to a continuous production, real-time information on shipment status was crucial." For construction, Sandvik produce virtually any construction industry application encompassing such diverse businesses as surface rock quarrying, tunnelling, excavation, demolition, road building, recycling and civil engineering. The range of products includes rock tools, drilling rigs, breakers, bulk-materials handling and crushing and screening machinery. For the manufacturing of these products, Sandvik relies on tens of raw material suppliers around the country. Sandvik wanted to have good visibility and control over inbound processes that included purchase orders and shipments from the suppliers. Since the raw materials are critical to a continuous production, they wanted real-time information on shipments’ and purchase orders’ status, for example, if they were late. Shipment status was, in many cases, gathered reactively and often after a shipment was already late. In addition, slow manual inbound processes were prone to errors and were challenging to keep track of. 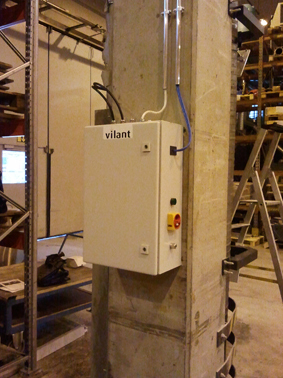 Vilant’s RFID solution was integrated into Sandvik’s V10 ERP system. For each purchase order that the supplier received, the system produces an RFID shipment label that follows the shipment along the way. Shipments are automatically registered as they enter Sandvik’s factory. Once a shipment arrives from the supplier to Sandvik’s factory, it passes through an RFID gate that reads the RFID label information and automatically passes it to the ERP system via Vilant’s RFID server software. In real-time, the order is fulfilled with 100% accuracy and there is no more need for manual typing of purchase order numbers or scanning barcodes. This has resulted into instantly accurate stock levels, fewer production breaks and lower buffer stock level. Hardware: RFID printer at supplier’s facility; Vilant RFID Smart Gate at inbound gate; RFID handheld device for shipments that do not pass through the inbound gate; RFID labels at the supplier’s facility. Software: Vilant RFID Server; Vilant RFID Client. Sandvik is a high tech, engineering group with activities in more than 130 countries and annual sales of more than EUR 11 billion. The Sandvik Group conducts operations in mining, machining solutions, materials technology and construction with responsibility for research and development, production and sales of their respective products. In Finland, Sandvik has three factories for mining and construction material like rock drilling, rock cutting, rock crushing, loading and hauling and materials handling.